Well we've made it to another Friday. It was another yucky morning out, not only is it sort of rainy and misty again but now we're also adding fog to the mix. Seriously gross weather. Fortunately I have decided that the Ikea pantry is my new favorite indoor backdrop, so at least I have something! I myself am in a bit of a fog today regardless of the weather. Got some unpleasant news yesterday and then didn't end up sleeping the greatest. I still think that the Pants Monkey and I will try to go see the movie tonight, but we'll see how I'm doing by the end of the day. Right now I have coffee. Mmm, coffee. It's the final day for the Super Stripes challenge! I went for a very bold stripe look today. 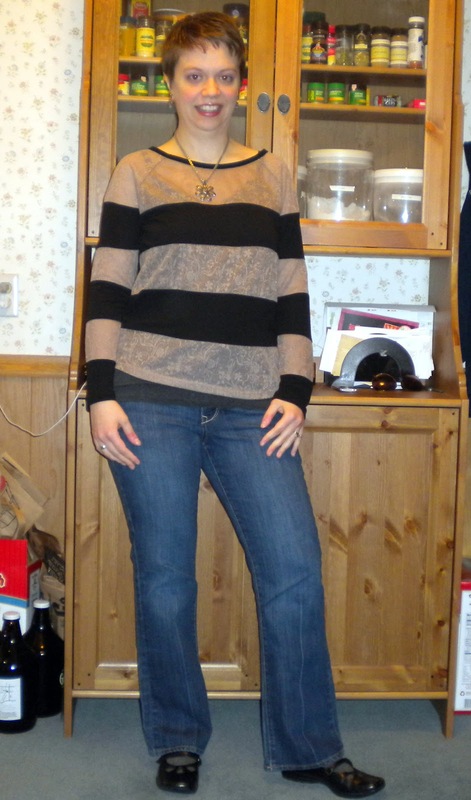 I love this shirt, it's appropriate for work and fun enough for a date night too. I had a lot of fun with the stripes this week, I own so many striped pieces of clothing that I could probably keep this going another week easily! Thanks again to Megan Mae and Keely for hosting this fun week! 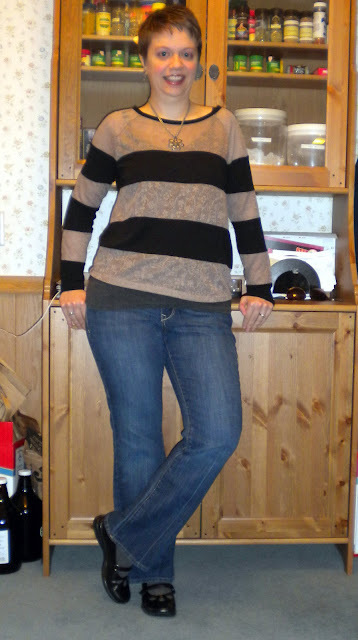 Visit the main participant post on Megan's blog here to see other bloggers showing off their stripes! Sorry to hear about your unpleasant news. Hopefully, things will start looking up. It is the weekend, after all! Super cute and I love your sweater! I am so sorry to hear you got some bad news. Sending you lots of good thoughts and happy vibes! I hope you have a good weekend. Hopefully things will begin to look up! On a brighter note, I am loving the wide stripes! You have been rocking the stripes this week! Sorry about the bad news and head-fog. But you're finishing out stripes week in a super cute way. I love the bold striped sweater. Don't forget to email Keely with your favorite look from the week for the roundup. I hope knowing it's the weekend makes the unpleasant news you received a little easier to handle. Positive thoughts being sent your way! Sorry to hear about your bad news Beth- I hope everthing works out and you're able to go to your movie. You look great- I love that top on you. sorry to hear about the bad news...take care and hope things will work out for you. You look casual chic in that striped top and jeans. I love all the stripes--that's one of my favorite things to wear! I hope your weekend got better!